The biggest drawback with the interleaved and overlapping road wheel arrangements found on various German-track-laying vehicles during World War II was their design complexity and weight. No other country in World War II or in the postwar years adopted a similar system. Despite its weight of almost 70 tons, the Tiger II was powered by the same 12-cylinder, 700 horsepower engine that propelled the 50-ton Panther medium tank, leaving it somewhat underpowered. This weight strained almost all the powertrain components of the German vehicle, including the steering mechanism and hydraulically operated transmission. The Tiger II had a top speed of 26 miles per hour and a maximum range on good roads of about 100 miles. Cross-country operational range of the Tiger II was less than 50 miles. The wider tracks of the Mark V and the Mark VI enables it to move much better cross-country and in muddy or snow-covered terrain, than the narrow tracks of the Sherman tank. The field expedient of duckbills [track extensions] added to widen the Sherman tread aids, but does not effect the advantage the German Mark V and Mark VI tanks have. It is my opinion that the Mark V and Mark VI enemy tank is far superior in maneuverability to our Sherman tanks. The small number of Tiger tanks built between 1942 and 1945 resulted in far fewer variants than those based on the chassis of German light and medium tanks. 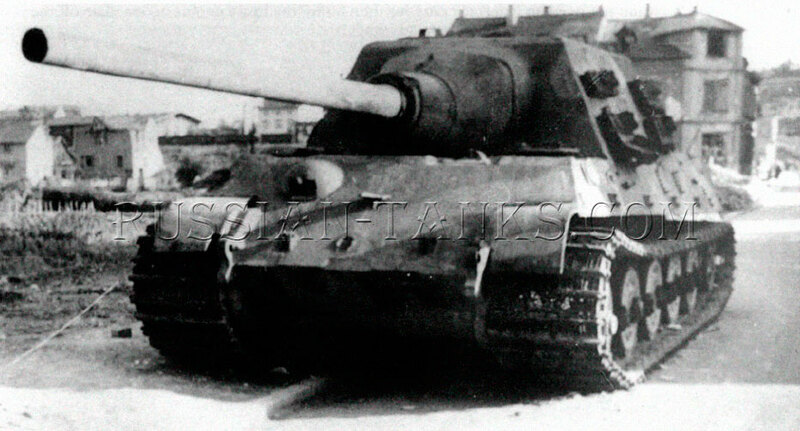 One of the few Tiger variants was based on German tanks combat experience in Soviet cities and the need for a very large close-range assault weapon. The gun had to be powerful enough to destroy an enemy-held multi-story brick or concrete building with a single round. To meet this need, Alkett adapted a large naval high-explosive depth charge (716 pounds) into a rocket-assisted projectile to be fired from a short-barreled breech-loaded mortar. This unique weapon system was grafted onto the chassis of a handful of Tiger I tanks between August and December 1943. Eighteen of the 65-ton vehicles (designated Sturmmoerser Tiger) were produced. The official German military designation for the Sturmmoerser was 38-cm RW61 auf Stu Mrs Tiger. A large, box-like armored superstructure on the front of the chassis housed the limited-traverse mortar and ammunition. Twelve rounds were carried inside the superstructure of the Sturmmoerser. To assist the seven-man crew in reloading the German vehicle, a small hand-oper-ated crane was fitted to the rear of the vehicle's superstructure. The weapon system was used at relatively close range, so the frontal armor was up to 150 millimeters thick, and the front glacis was steeply angled. The rocket-assisted projectiles could be fired either in direct or indirect fire mode. By the time the Sturmmoerser Tigers reached field units, the need for this specialized weapon system had vanished. The Sturmmoerser is yet another example of failed development efforts indulged in by the Germans toward the end of World War II. 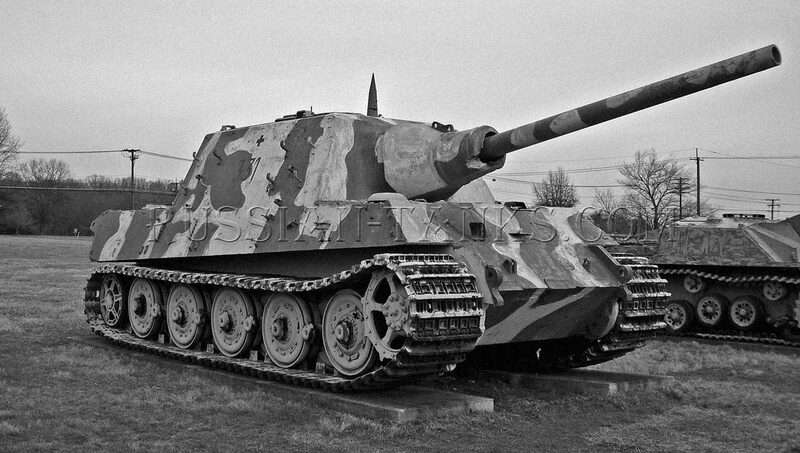 Another specialized vehicle failure built on a Tiger tank chassis was the massive 70-ton Jagdtiger. The first prototype showed up in April 1944. It was armed with one of two types of 128-mm guns. The weapon was originally developed as an antiaircraft gun. Like other wartime German Jagdpanzers, the gun was mounted in a limited-traverse mount. The official German designation for the Jagdtiger Tank was Panzerkampfwagen Jaeg Tiger Auf B. The Jagdtiger was based on a King Tiger tank chassis that was lengthened by 10 inches. The 128-mm gun was mounted in a large, sloped, armored box-like superstructure. The frontal armor was 250 millimeters thick. Excluding the gun, the vehicle was 23 feet 10 inches long, 11 feet 9 1/2 inches wide, and 9 feet 3 inches tall. Including the gun, the Jagdtiger was 32 feet 2 inches long. The six-man gun crew included a vehicle commander, gunner, and two loaders who occupied the heavily armored superstructure, and a driver and hull machine gunner/radio operator located in the front of the hull. The ordnance department of the German army set the requirements for the Jagdtiger Tank in early 1943, with an initial order of 150 vehicles. The German firm of Nibelungenwerke finished the first vehicle in July 1944. Only 40 to 70 vehicles were produced before Germany surrendered. It is estimated that fewer than half actually saw combat. A number of Jagdtigers were armed with the same 88-mm gun mounted in the Jagdpanther when the standard 128-mm gun was not available.